Studies have shown that aging adults who live alone are more prone to feelings of isolation and separation from family, friends and society in general. Often, such isolation leads to depression. Companionship services provided by Affordable Home Health Care reduce the risk of you or a loved one experiencing such isolation and depression. Many of us cannot be with our loved one every single day. We have our own work and family obligations. Sometimes, a phone call is not enough, nor are quick visits to help with errands, finances, or household chores. At times like this, companionship services are an ideal solution. 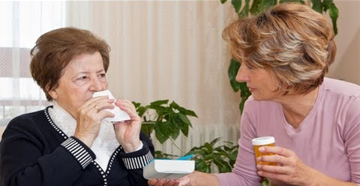 Whether such services are required for an hour a day or several hours a day, Delicate Home Health Care provides companionship services that keep your loved one connected to others. Mental stimulation is as important as physical mobility and movement. Family members and caregivers are often unable to provide such interaction with their loved ones due to other obligations. While physical support and help is important, so too is mental and emotional wellness for seniors. We can fill those gaps with compassionate, friendly, and trained individuals experienced in providing options for seniors based on their preferences, likes, and ideas. Stay stimulated, even if you or a loved one lives alone. To learn more about our companion services, give us a call today at 1-800-216-0372 or 1-703-334-0105.